Jac. de Vries produces IR drying systems for a variety of industrial applications, where quick pasting and drying is to the essence important. In particular when pasting difficult materials, under tension or compression, bent surfaces and mass production, the process may benefit greatly from IR drying. Edges or corners that may come loose if the paste is not dried adequately, will have a better bond through quicker drying. The same applies to lacquering or spraying after which further processing must take place. IR drying systems by Jac. de Vries may yield enormous time gains for instance in the rubber industry, for pasting mattresses, carpet, formica, wood plies, brake shoes, processing films such as PE and PET, powder coating on MDF, the possibilities are endless! Jac. 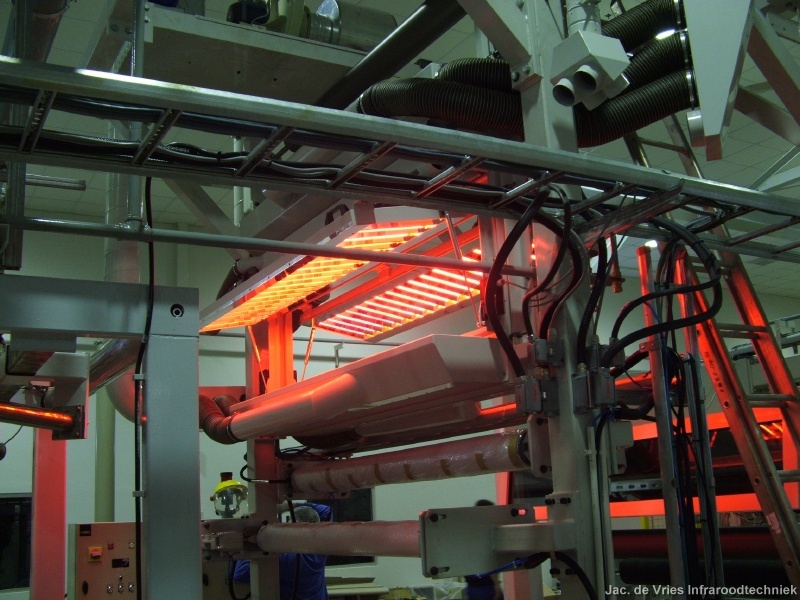 de Vries Infraroodtechniek designes made-to-measure IR drying systems for a variety of industrial applications, fully geared to the properties of the products and the production processes. Compared to conventional drying techniques, usually very considerable time gains can be realised, resulting in a major production acceleration. More information? Just contact us by clicking the ‘contact’ button.